At the foundation of ATLARGE, there are two principles that started it all. The first; “Wherever we are, whatever we do, we have a duty to serve our community”. The second; “To introduce to the world how the creative application of technology can empower great ideas.” These are at the heart of what drives the people at this company and something that immediately resonates with not only our team, but also the clients we serve. THE FIRST INTRO TO MY COMMUNITY. The second principle is what initially attracted me to ATLARGE. As a developer with a high interest in the tech industry and a focus in the world of web, I came here just wanting to build some cool and unique projects with the people I enjoyed working with and could learn a lot from. However, within my first couple months of working here, I was introduced to the heart of our company’s first principle when the team took a Friday off to go volunteer at All Faiths Food Bank. There, we helped sort and package canned goods for a program that provides students with backpacks full of nutritious food for the weekends at more than 47 schools. While the experience itself was fun, rewarding, and team building, the introduction to this community organization’s hard work, as well as the issues that were present in our community, were eye-opening. I learned things about my community that I had never thought of before, such as 44 percent of homes in Florida aren’t able to afford basic household needs. This brought to my attention how many challenges people in the community face each day, and the organizations that battled to help people overcome them. Following my experience with our team at All Faiths, I came to realize how much impact a small group of dedicated people and organizations can have in a community. The fact that the team I was a part of were some of the people that created this impact and drove change was inspiring. Not only did we contribute through by volunteering at organizations, we also created our own approach. From the initiatives served through our company’s nonprofit arm, DreamLarge, to resourcing brave and bold ideas that can shape our future, to facilitating one of, if not the most, inspirational single-day events, PINC. All of these come together to create the foundation of our company’s first founding principle. With everything that was happening around me, I was motivated to do something myself, and thought about what I could contribute outside of work. The approach I started with was to take it one step at a time, so that’s what I did. I started small by working with a partner, with our first goal to connect with our community’s neighbors. To get the ball rolling we started a volunteer group, in order to help the neighborhood introduce itself. Within one weekend, we threw together a website, made a mural, started our social presence, and rallied a dozen neighbors for our first neighborhood cleanup. Over the course of the next year our growing group became increasingly involved in the community as our efforts helped it grow. 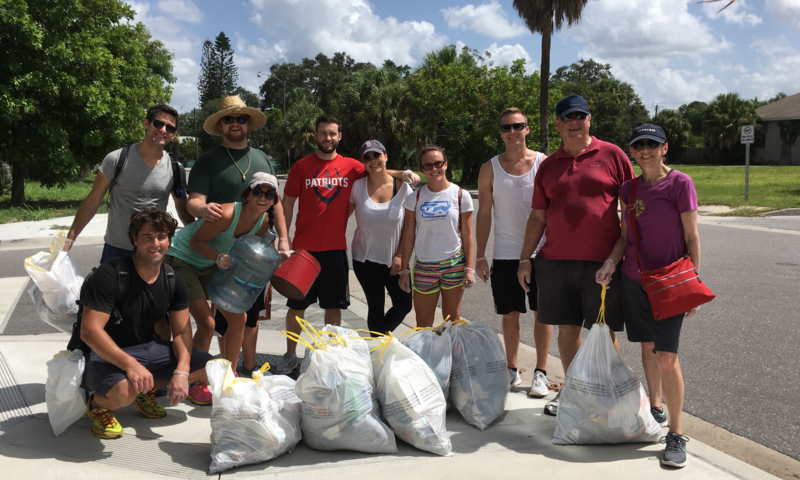 Throughout the year we created many opportunities, from 5 community cleanups resulting in a pick up of more than 100 bags of garbage, to running a local food drive and connecting hundreds of neighbors. As we continue to grow and move forward we’re using our technical strengths and abilities to help connect and project the amazing growth that is happening here in Sarasota. We’ve rolled out a community calendar and a monthly newsletter. We’ve also connected the neighborhood to the social media realm and are rolling out a new platform that will help support residents and business owners that are interested in shaping the community we live, work, and play in everyday. Though it’s all a small effort, the experience has been very rewarding and educational. And working with my ATLARGE team and the DreamLarge initiatives has taught me that sometimes it’s the smallest efforts that can create the most impact.